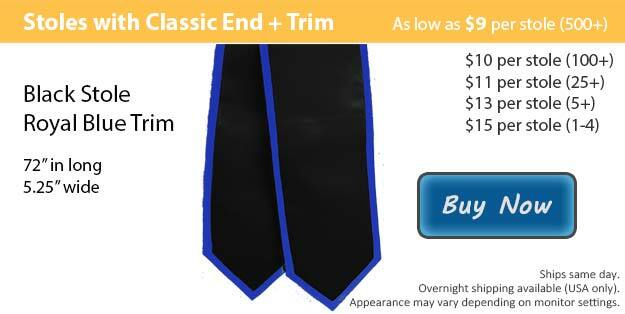 Classic black stoles with royal blue trim just might be the exact accessory that you need to complete your graduation outfit. The cold black allows the royal blue to pop, making it an outstanding way to represent yourself this graduation. In order for someone to successfully accomplish their dreams of graduation they must first put in an enormous amount of torturous work. It is our goal here at Honors Graduation to help students who have made the effort and earned their diploma or other degree to be prepared for their big day. As your friends and family join you in celebration it is important to reflect on the hardships as well as the positive moments you experienced along your journey that brought you to this point. After so many years of giving it your all you now know that you are capable of accomplishing anything that stands in your path. Graduating students have been known to wear a graduation cap and gown, accented with some kind of graduation accessory for their ceremony. They do this to follow the tradition that we have used for a number of years now. We have everything that you will need in order to be ready for your graduation in one convenient location. At Honors Graduation, within each category you will find a large variety in graduation attire. Our stoles for example are available with either the classically shaped bottom or the angled bottom based on your preferences. We have a long list of available stole colors in both solid options or with the contrasting trim. At Honors Graduation we can even embroider your very own design onto your graduation stole for a small additional fee. Our stoles are built to last, using only the best materials to give them the longest life possible. We know what graduation means to you so we strive to give you a product that you can hang on display for years to come.